EYE on Art is a series of exhibitions which straddles the border between visual arts and film. EYE presents a different artist in this series each year. EYE on Art gives the participating artists the opportunity to present their work in a museum environment which is technically equipped for displaying video installations. 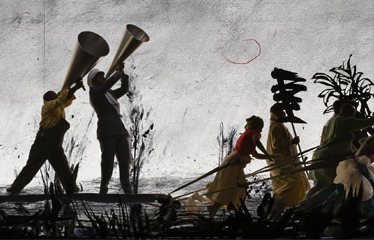 The first exhibition to be presented by EYE in this series is If We Ever Get to Heaven, an exhibition with new work by William Kentridge (Johannesburg, 1955). Ammodo supports Eye on Art as a way of contributing to the establishment of trans-disciplinary exhibitions, the development of the participating artists and the formation of an international discourse concerning visual arts and video art.